I would like to dedicate this newsletter for Magic and Mystery in our life. Magic and Mystery has the capability of transforming our life into interesting and whole life. For me, the sense of mystery is a very common experience. Mysterious, unexplained things happen to me all the time. Maybe it is just coincidence, but it does not matter to me. I choose to see them as mystery and they fill my life with curiosity. One of the reasons why I make my jewelry is to bring my customer that same sense of magic and mystery. A sense that there is something beyond scientific knowledge. That there is magic in life that we cannot explain but we can certainly experience and in full power. 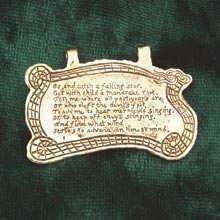 The Key of Magic pendant contains one of my favorite poems - “Go and catch a falling star”, written by the Jacobean poet John Donne (1572 – 1631). John Donne is known for his metaphysical poetry that he wrote during the 17th century and for the influence his poems has had on writers and poets ever since. His works stand out because of their wit, the feeling of mystery and magic they impart and their intense emotion and wisdom. 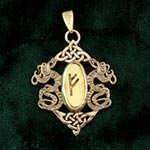 Around the pendant appears one of my favorite symbols, the Orborus, a dragon devouring its own tail. For me this ancient symbol represents the magic of the universe that created itself from within itself and that continues to develop and awaken within us the realization of the endless process of rebirth and growth. The pendant is meant to bring the wearer a sense of magic and passion to life. In ancient Nordic poems, the runes are seen as a means for healing, prediction and soothsaying and as a means of receiving information from the world beyond. The poems tell of Odin who wanted to get transcendental knowledge and who hung himself upside down from the “Tree of the World”, the “Yggdrasil”. After nine days and nights the runes were revealed to him and he absorbed their powers. My Rune series are available in three styles - rings, pendants and bracelets. The idea behind each ring, bracelet or pendant, is that you choose the symbol that is suitable for you and it is this symbol that is incorporated into your jewelry. The symbol strengthens those elements that you seek in your life. For a ring or a pendant, you choose one Rune. 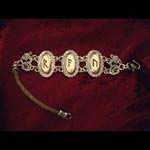 For a bracelet, you choose three (it is possible less – contact us for details and pricing). 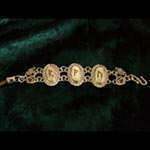 Full details about each of the letters in the Runic alphabet can be found on the product pages. 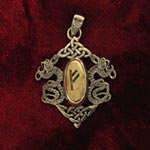 Runes pendant - you select the rune fit to your needs. 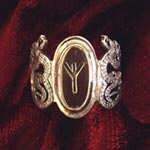 Runes ring - you select the rune fit to your needs. 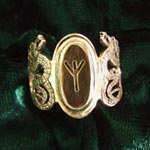 Runes bracelet - you select 3 runes that fit to your needs.